Here we go again rolling on through another Mascot Monday. Oh and we are rolling alright. Some say we may be thundering. 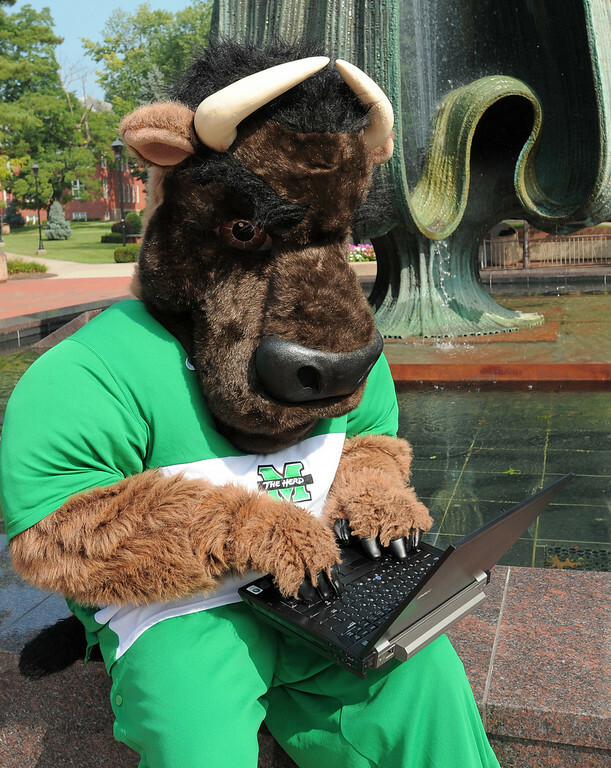 That’s right, this week we will take a look at Marshall University’s mascot, Marco the Buffalo. Now I’ve covered live buffalo mascots before (Ralphie anybody?) but this is the first time we’ll see it represented in costume format. How does Marco stack up against his live counterpart? 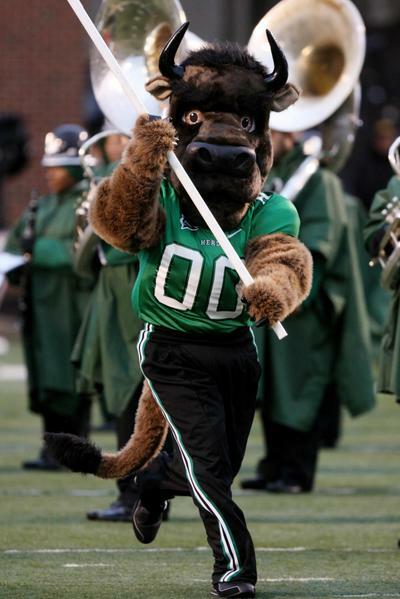 More importantly, does Marco live up to the school’s nickname, The Thundering Herd? We’ll find out about that as well as how mascot are marketed to kids so let’s rumble on through. We Are Marshall. That’s the first thing that comes to mind when I think about the Thundering Herd. Well, it’s in there motto and it gelled into our minds after that fateful plane crash. Way before any of that happened, the university first say it’s establishment in 1837 as a private school. The football team didn’t see the field until 1895, however. They had some earl 1900s success but really didn’t enjoy winning until the middle 1990s to early 2000s. Now the name ‘Thundering Herd’ came from a Zane Grey novel released in 1925 but it took a vote in 1965 to set the name in stone. Before the Thundering Herd name, they were known as Indians or Normalists. The use of a live bison in the early 1930s help put that name to rest. As part of celebrating the new mascot, paper mache representations for homecoming parades of the rough looking animal popped up as well. That led us all the way to the early 1980 with a full costumed bison roaming the sidelines as Marco the Buffalo. There was a live mascot on the field during some of that history but the maintenance costs forced the school to retire the live mascot. So let’s look at Marco. Marco the Buffalo falls in line again with most mascots and dons a full football uniform, sans helmet, on the field. To keep up with the actual animal appearance, Marco sprouts a tail from his behind and some furry meat hooks as arms. On top we get the reason why he doesn’t wear a helmet. Marco’s got a huge noggin’ and some pointy horns as well. His giant snout doesn’t snort smoke yet but if the school was smart, they would implement that immediately. Like most mid-conference mascots, I had a heck of a time coming up with some hard data on Marco. The best thing I could come up with, outside of the references on Wikipedia, was the info club page for the Big Green Kids Club. Now I understand that big, furry costumed creatures will always appeal to kids, but as a school you need to have a real page for the whole spectrum of fans to learn about your mascot. I don’t want to find out through some obscure article in an archive on the student newspaper to find out that Marshall had a female version named Marsha for a couple of years. Do the alumni, students, fans, and potential recruits and appeal to more than just the kids. Okay, now that I’m off my soapbox, let’s talk about where Marco the Buffalo fits. He’s average. There’s nothing that jumps out and says, “Oh Yeah!” That said, there’s nothing really bad that I can point out for Marco. He did win a mascot championship in 1991 so that’s a point of interest. It would just be so much easier if the school invested some time into creating a proper portal for Marco the Buffalo. Most people won’t dig through the interwebs as thoroughly as I did to find this stuff out. Previous PostCrib Sheet: Pop Open Your WindowsNext PostCrib Sheet: Crack that Whip!